The Data Exchange Module provide an interface to seamlessly share project data between SKM projects and other third-party software. Exchange format includes Tab Delimited, CSV, and SKM XML. Also includes an interface to exchange data with Autodesk Revit and Intergraph SmartPlant Electrical. Watch the Revit-SKM Data Exchange in Action! Autodesk Revit is a building information modeling (BIM) software that enables architects, engineers, designers, and contractors to plan, design, construct, and manage buildings and infrastructure. The Autodesk Revit-SKM Data Exchange module provides a convenient and accurate way for electrical engineers to import electrical data and connections from Revit into SKM projects. Various complex analyses using SKM’s calculation engine can then be conducted on the imported Revit project. The results are saved in the SKM project and can be exported back to the Revit project. This is a very useful tool for electrical engineers planning, designing, maintaining and operating a complex electrical distribution system. Both software packages work complimentary to each other by supporting each other’s strengths. The diagram shown below illustrates the data flow process. The SmartPlant Electrical (SPEL) Data Exchange Module enables electrical engineers to import SPEL electrical equipment data and connections into SKM projects conveniently and accurately. Once imported, engineers can then conduct various complex analyses using SKM’s calculation engine. The results are saved in the project database and can be exported back to the SPEL database. This module is invaluable to leverage the power of SKM and SPEL software for planning, designing, maintaining and operating a complex electrical distribution system. SKM and SPEL software packages work complimentary to each other by supporting each other's strengths. Comply with corporate or project standards and manipulating electrical data throughout the plant and project life cycle. 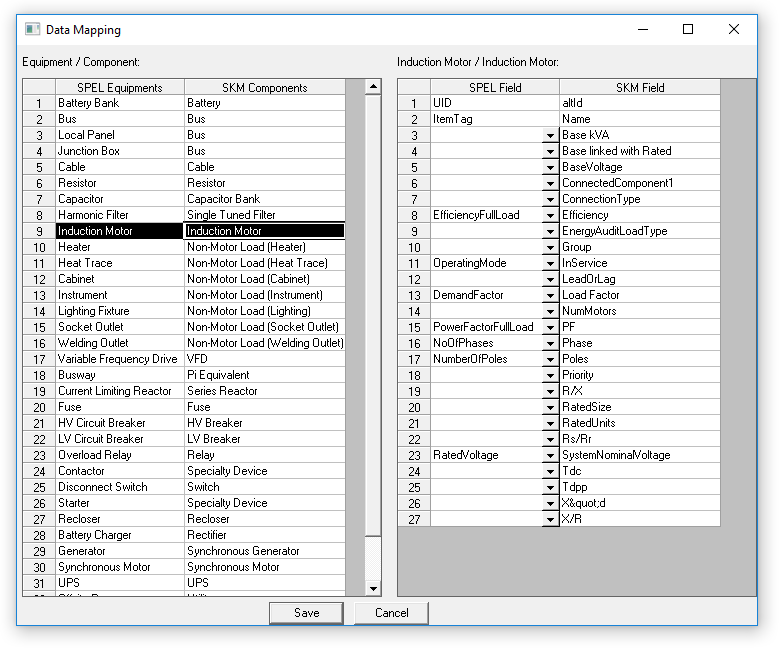 Import SPEL projects into SKM software to take advantage of a powerful calculation engine to conduct various complex analyses of electrical power systems, such as load flow analysis, fault analysis, harmonic analysis, transient stability analysis, cable ampacity calculation, arc flash calculation, reliability evaluation, protective device coordination etc.